Eminem to fans: "There is no Relapse 2"
Eminem fans holding their collective breath for the release of Relapse 2 can now exhale. "There is no Relapse 2," Eminem Tweeted early this morning. This brief statement would appear to lay to rest any possibility that the the promised sequel to Mr Mathers' 2009 comeback album Relapse will be ever be issued. Eminem didn't indicate whether an all-new album would replace Relapse 2 or if he was merely shelving the record altogether. But he did offer some sort of hint last month in a Tweet in which he said, "Don't worry. Some big news is coming. Soon." Obviously, something is afoot. But what? Last year Eminem stated that he would release Relapse and Relapse 2 together in 2009. The Dr. Dre-produced Relapse was issued last May, but its sequel was eventually pushed back to 2010. 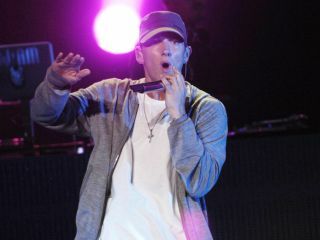 The rapper did release Relapse: Refill, which consisted of leftover tracks from the Relapse sessions. It was to "tide the fans over until we put out Relapse 2 next year," Eminem said. "I got back in with Dre and then a few more producers, including Just Blaze, and went in a completely different direction which made me start from scratch. The new tracks started to sound very different than the tracks I originally intended to be on Relapse 2, but I still want the other stuff to be heard." "I had originally planned for Relapse 2 to come out last year. But as I kept recording and working with new producers, the idea of a sequel to Relapse started to make less and less sense to me, and I wanted to make a completely new album. The music on Recovery came out very different from Relapse, and I think it deserves its own title." Eminem offered no other details, nor did he specify an actual release date for Recovery.